RunnerDude's Blog: The 3-Rep Exercise? 8-10, 10-12, 12-15...these are the common number of reps you'd do for any give exercise. Ever heard of a 3-rep exercise? I have one plank exercise where 3 reps is plenty. Actually it may take a while to master 1 or 2 reps. 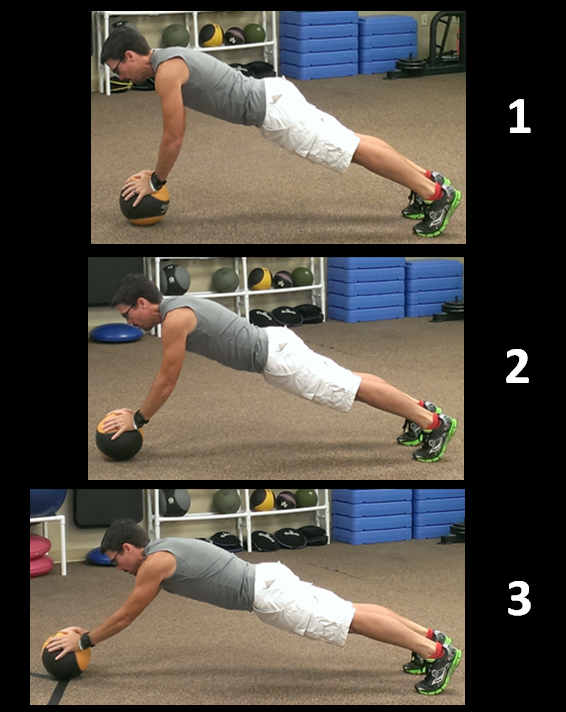 This exercise-the Med Ball Roll-Out Plank-takes the front plank to an entirely different level. It works all of your core, glutes, lower-back, legs, and upper-body! Note: Don't attempt this exercise until you've mastered holding a regular front plank for at least 60 seconds. To complete the Med Ball Roll-Out Plank, position yourself in a dolphin plank (arms extended) position with both hands a top a hard medicine ball. Your hands and the ball should be directly under your chest (see fig. 1). Keeping the core engaged, use your hands to slowly roll the med ball forward away from your body (see fig. 2). Continue rolling out the ball as far as you can (see fig. 3), keeping in mind that you're going to have to roll the ball back to the start position. Once you've rolled the ball back to the start position, that's one rep. See how many reps you can do. Note: It's important to keep your core engaged and your back flat during the entire movement. Do not let your back sag. A modified version of this exercise can be done by placing your knees on the floor. Send a Coach to Sweden!